Hot off the press from the luxurious Diamond Girl Yacht, with Superyacht Sales and Charter. “Celebrate life and make memories – we can make it happen for you.” This is the mantra of Superyacht Sales and Charter, a company who offers yacht charters, yacht sales, yacht management and charter management. After my recent yacht trip through the Virgin Islands, I can’t overstate how much they surpassed my expectations and delivered on their promise. Superyacht Sales and Charter made it happen for my family in the most amazing way! We now have fantastic memories that’ll last us a lifetime. We worked with Superyacht Sales and Charter to plan every detail of our yacht trip from start to finish. They walked us through their inventory of yachts to help us identify the perfect boat, an amazing crew, and a phenomenal chef. Diamond Girl Yacht is one of 11 yachts currently managed by Superyacht Sales and Charter. Looking through the various available charters and selecting the yacht that perfectly fit our holiday needs was a large part of the fun! The website is very user friendly, well designed, and makes it easy to understand the layout and amenities that come with each yacht. 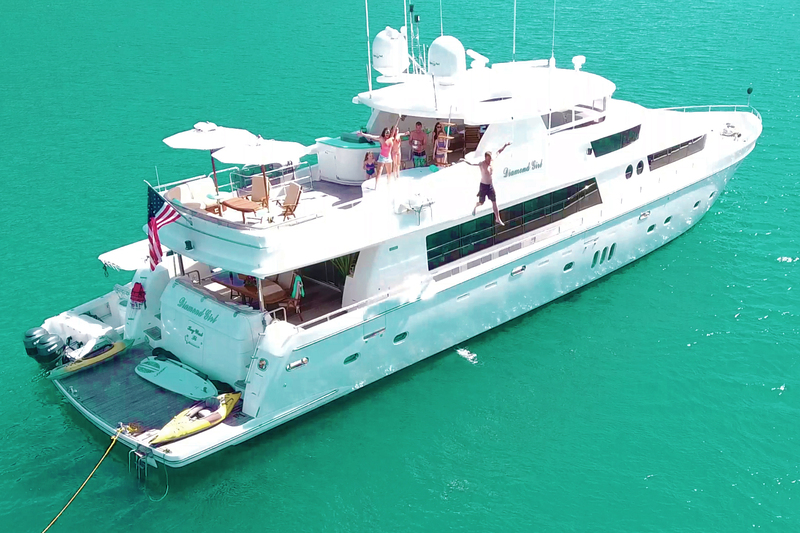 Diamond Girl was the perfect size for our group, but there are many different sizes, styles, and amenities so you can ride the seas in style on the yacht you’ve always dreamed of. There is nothing that melts away stress like a week on a crewed yacht. You’ll know you’re in for a treat the moment you step foot the boat and feel the breeze on your face. You’ll promptly be offered the beverage of your choice, while a crew member whisks your luggage away to your cabin. If you’re a parent, like me, you’ll find yourself thinking, “Do I really not have to cook one meal, do one load of laundry, or pick up after anyone for the duration of the entire charter?” This is true relaxation! But even better is the fact that you get to move around from island to island without having to pack or unpack the entire time. It’s like having your own private 5 star hotel that moves around with you. Since you’re the only guests everything is catered to meet your specific needs and make sure your group is happy. From my experience, yacht crews really seem to have a passion for what they do, and it shows in all aspects of the way the yacht is run. They take care of everything, and I mean everything. Whenever I left my cabin, I’d come back to a perfectly clean and spotless room, laundry done, and fresh towels hanging in the bathroom. The chef planned each meal around our preferences and the food was fantastic! The captain was very flexible with what we wanted to do and where we wanted to go, and found a way to squeeze it all into the time we had. One of the many benefits of a yacht trip is that it appeals to all age groups. So you can bring your kids, your friends, and even grandma and grandpa, and they’ll all have an unforgettably marvelous experience. There are activities for all age groups and all tastes. 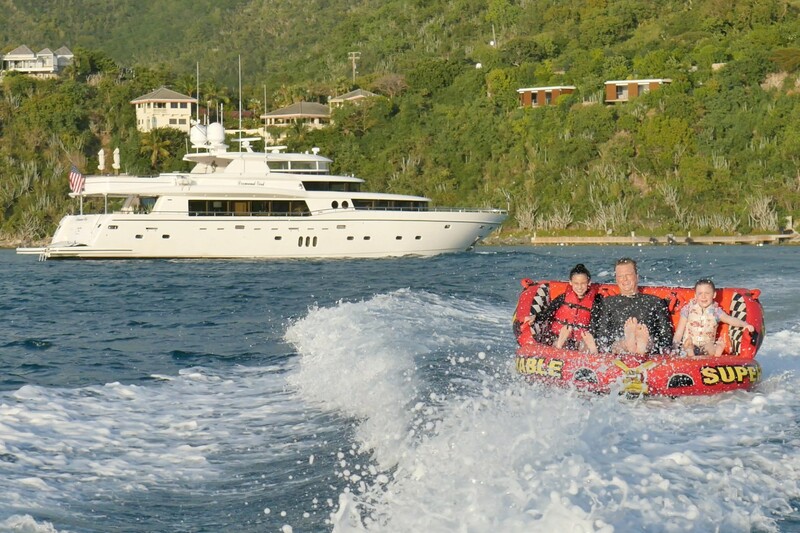 Everyone’s only responsibility for the duration of the charter is to relax and have fun! This is a sponsored article written on behalf of Superyacht Sales and Charter, but the opinions expressed in this article are, as always, my own. Amazing video! And I love the drone shots of the yacht! Looks like you guys had an awesome time! What beautiful pictures of such gorgeous places and faces!!! We sold our family yacht that we kept in a charter fleet in the San Juan Islands. We’re definately going to check out Superyacht Sales & Charters. Misha, your world looks so perfect, precious, & pretty darn Fun!!! Thank you Matthew! Do you mean the San Juans in Washington? Love the video as you really have portrayed what a special vacation on board a yacht is all about! Such a pleasure working with you from the beginning and look forward to doing so again. This really was the ultimate family vacation and you captured it perfectly!